VELCO is committed to environmental sustainability as expressed in our Environmental Sustainability Policy. Its vision: VELCO seeks to be an environmental sustainability leader. Environmental stewardship, sustainability, and intergenerational responsibility are core company values that are driven by our employees and supported by our stakeholders. We create healthy and sustainable environments at work, in our communities, and throughout Vermont, while maintaining the highest electric transmission reliability standards. Environmental stewardship is embodied in the company’s culture by protecting and enhancing the environment in traditional and innovative ways for all of our work, and seeking partnerships that extend these values in all of the areas we touch. Click here for the full text of the policy. VELCO has pledged $20,000 to the Trust for Public Lands to the Catamount Community Forest Project. The project aims to acquire and conserve a 383-acre property in Williston, Vermont. This important piece of Vermont landscape is home to the Catamount Outdoor Family Center and eight acres of wetlands and marshes, including two ponds that support waterfowl and provide important deer wintering habitat. The project is currently working to raise funds to purchase the property and transition the ownership and land management to the town of Williston. Once complete, the newly named Catamount Community Forest will safeguard the property’s natural resources as an ecological haven and recreational hub for generations to come. As one of Vermont’s largest land managers, VELCO is proud to be part of this opportunity to protect these irreplaceable water, wildlife and open spaces for recreation and reflection. This is one of many ways VELCO fulfills its commitment to environmental stewardship, sustainability, and intergenerational responsibility. To learn more or support the project visit Catamount Community Forest Project. VELCO's vegetation management program is officially accredited as a Right-of-Way Steward for sustainable integrated vegetation management. VELCO is recognized with the Right-of-Way Steward Founder's Award for leadership in receiving one of the first two Right of Way Stewardship Council's accreditations globally. As of 2018, only seven utility companies have received accreditation as a Right-of-Way Stewards, demonstrating that we meet rigorous standards for performing integrated vegetation management on our utility rights-of-way. Recently, the Utility Arborist Association (UAA) produced a video to highlight the work of utility environmental stewards, including our VELCO team. Come take a journey through compatible, biodiverse, pollinator rich, stable, plant communities across the nation in UAA’s first Environmental Stewardship showcase video. during construction of the Northwest Reliability Project. VELCO strives to maintain its transmission corridors in an environmentally sound manner which promotes habitat for Vermont’s wildlife and benefits its rare flora and fauna. 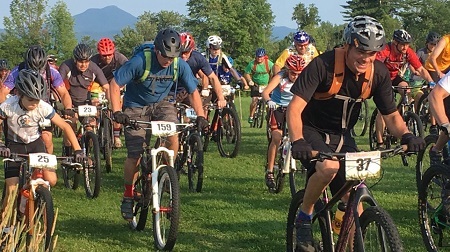 We are a participant in the Vermont Green Business Program and first became a Vermont Business Environmental Partner, the forerunner of the current program, in 2008. VELCO has been involved with protecting and creating safe osprey nests since the early 1990s. Our crews have constructed successful nesting platforms at Colchester Pond in Colchester, at the Sand Bar Wildlife Management Area in Milton, in winter of 2005 near Lake Memphremagog and on the shore of South Slang in Ferrisburg. The photos below show a special project in which VELCO dismantled an existing nest and relocated it on a new nesting platform erected especially for this breeding pair. VELCO participated in the Northern Forest Woodcock Initiative, a wildlife habitat improvement project on the Silvio O. Conte National Wildlife Refuge in Northern Essex County. In an effort to assist the National Wildlife Refuge, VELCO revitalized the woodcock habitat adjacent to our transmission right of way. The first phase of the 20-year program began with the clearing of approximately 26 acres of land within the refuge, under the direction of the USFWS Biologists & Foresters. Visit Timberdoodle.Org for more information about this effort. As part of the natural resource assessments performed for VELCO projects, special resources are located in the field by VELCO environmental team scientists and environmental consultants with a global positioning system (GPS). These regulated features include threatened and endangered plants, wetlands, streams, and archeological sites. VELCO uses state-of-the art GPS units, capable of a high level of accuracy that rivals standard methods of data acquisition such as instrument surveys (i.e., stadia rod and compass) while generating useable data in a cost effective and timely manner. Once gathered, the field data is inserted onto the project site plans for use by company contractors and employees during construction of the project. This valuable data is then used by VELCO's right-of-way management department during routine vegetative management of the line and during transmission line maintenance. The data lessens VELCO’s impact on the environment by ensuring that work crews on our rights of way have accurate and relevant data depicting regulated resources so they can either avoid or take measures to mitigate impacts. 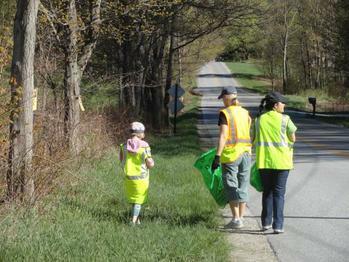 Throughout VELCO diverse efforts are underway to contribute to environmental sustainability. Employees volunteer time and effort to environmental initiatives and meet to share ideas and discusses ways to reduce our impact on the environment. Initiatives are proposed and implemented in areas such as; waste reduction, energy conservation, recycling, and community volunteer efforts. 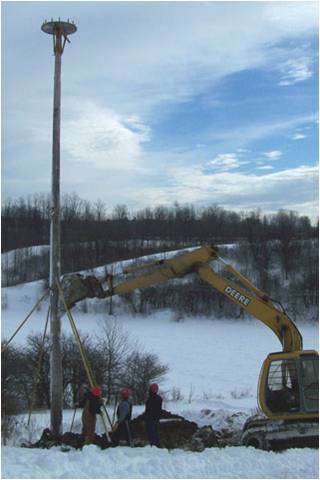 From 2005 to 2007, VELCO funded a series of archaeological studies in advance of construction of the Northwest Reliability Project. The studies were undertaken by the University of Vermont Consulting Archaeology Program and the Archaeological Services at the University of Massachusetts in Amherst. 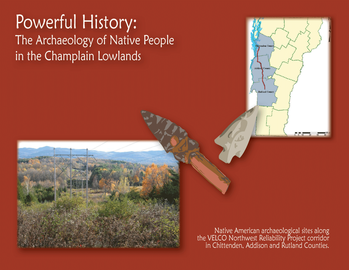 VELCO has published a handbook describing the studies that is aimed at students and adults interested in the history of Native American people in the Champlain Basin before the arrival of Europeans. The handbook describes some of the 113 pre-contact Native American archaeological sites researched on the NRP corridor. You can download the handbook in PDF format here or request one or more copies by mail on our Contact Us page.